After eighty three days of penance and spiritual practices Parshva-muni came to Ashrampad garden in Varanasi and stood in meditation under a Dharanendra tree. With fast increasing purity he attained enlightenment or omniscience on the fourth day of the dark half of the month of Chaitra. Now he was visualizing everything in the entire universe. 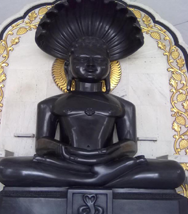 Lord Parshvanath gave his first discourse on the form of religion. He propagated the four dimensional religion (Ahimsa, truth, non-stealing and non-possession) for upliftment of the soul. Shri Parshvanath Digamber Jain Mandir Pisanhari Madiya, Jabalpur, M.P.